Here at Nature’s Script, we salute our veterans, active duty military personnel, retired military and military spouses and dependents. Thank you for your service! CBD has the potential to deliver a variety of physical and mental therapeutic benefits. It can be hard to understand what our military personnel goes through when they return home from servicing our country. Nature’s Script wants to provide a natural and safe alternative for medicinal relief, differing from traditional medications. Hemp Extract is a natural compound that has seen success in helping treat post-traumatic stress disorder (PTSD), anxiety, chronic pain, insomnia, and more. To show our appreciation for your service, we’re proud to offer a lifelong 15 percent discount for active and retired members of the military. Fill out the form on the right to redeem your Hemp Extract discount. Providing valid photo ID is optional. Hemp Extract, also known as Hemp Oil or CBD Oil, is a natural compound derived from Industrial Hemp. Hemp Extract is a natural supplement referred to as a “cannabinoid.” Hemp Extract has gained recognition for its positive influence on the body’s Endocannabinoid System (ECS). Every human has an ECS that helps regulate mood, sleep, pain, and inflammation. When you take CBD, it stimulates the body to produce more of its cannabinoids to help relieve areas of distress. Hemp Extract thus has the potential to alleviate anxiety, PTSD, insomnia, chronic pain, and joint issues. What are the Benefits of Hemp Extract for Veterans? Unfortunately, PTSD is a severe condition that affects many of our military personnel. PTSD can occur when a person experiences or witnesses a traumatic event. Symptoms of PTSD can include behavioral changes, trouble sleeping, traumatic flashbacks, nightmares, and elevated anxiety. Hemp Extract is frequently used to help regulate mood, anxiety levels and sleep pattern. CBD is often effective in helping those affected by PTSD find relief. Does Hemp Extract Get Me High? Hemp Extract is non-psychoactive, so it will not cause you to get “high.” Our Hemp Extract products are considered “Isolate,” meaning they do not contain THC. Our customers often report that Hemp Extract products help them relax and attain a state of calm, all without feeling “high” or paranoid. Are Nature’s Script Products Legal? 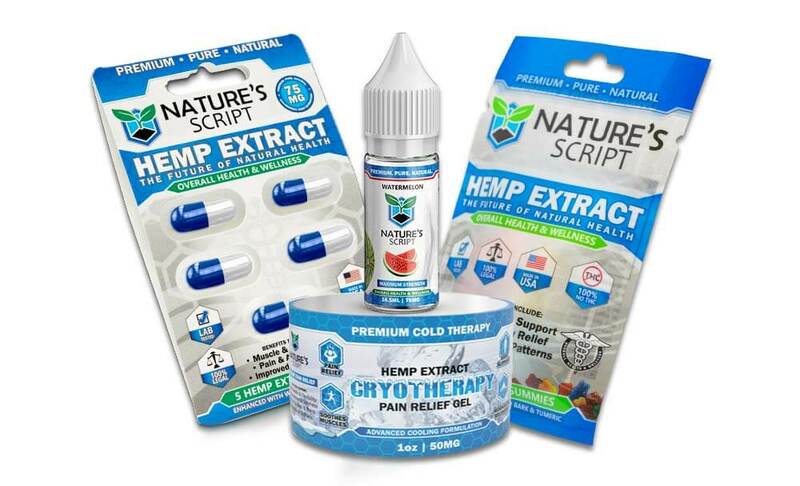 At Nature's Script, we extract our CBD from premium Industrial Hemp, and our products contain zero traces of THC. This allows us to maintain legal compliance to produce federally legal products. Due to the complete absence of THC in our products, or Hemp Extract will not cause a failed drug test.